The famous River Walk abounds with restaurants; this Texas bistro rises above the tide. 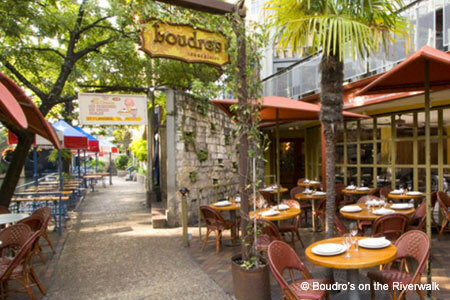 : Boudro's is an exception on the River Walk: its food is notable, the service is professional, and the prickly pear margaritas are more than pretty-in-pink. We can’t resist the tableside guacamole, either, especially if we’re seated right on the river bank under the “potato chip” umbrellas --- easily one of the best al fresco settings in town. Try the mesquite-grilled quail or house-cured salmon bruschetta as appetizers, then move on to Boudreaux’s shrimp and grits with apple-smoked bacon, or perhaps either the Black Angus center-cut filet or the achiote-spiced double-rib lamb chops. A dish called “Duck Three Ways” should strike fear into the fowl that patrol the river. Lunch options are equally appealing and include a pulled pork sandwich and a mesquite-grilled salmon salad. For dessert, consider a whiskey-laced Louisiana bread pudding. A modestly sized but carefully considered wine list, more international than before, adds appeal for natives and newcomers alike.